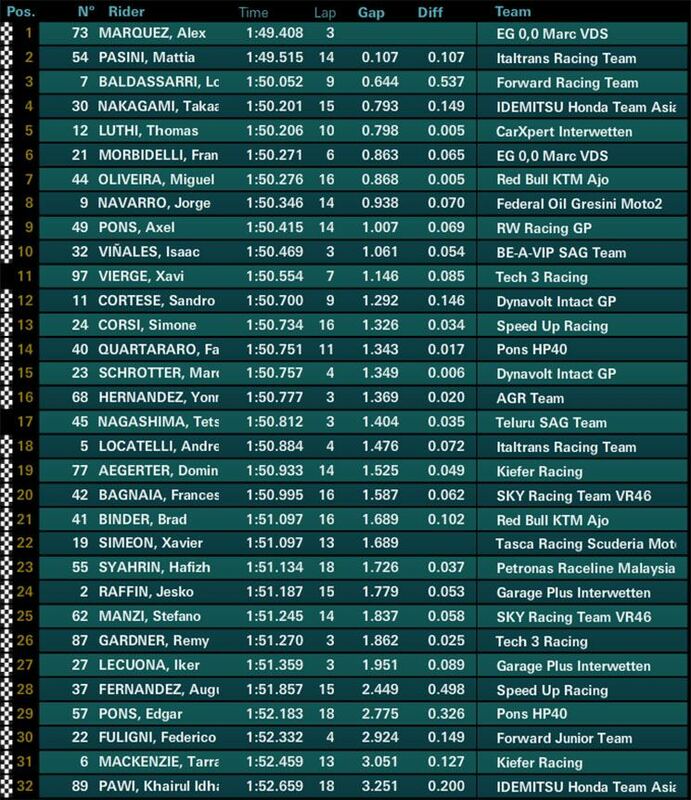 Alex Márquez will lead tomorrow the starting grid of the Catalunya Grand Prix after getting pole position today in a hot Moto2 qualifying session. The Marc VDS Racing rider stopped the race in 1: 49.408 early in his third lap, a time that finally gave him the pole ahead of Mattia Pasini, winner of the last Grand Prix of Italy, and who placed himself second with the time of the session practically finished, to only one tenth of Márquez. The first line of Moto2 completes another Italian, Lorenzo Baldasarri, rier of the Forward Racing, that has been far from the time of Márquez, concretely to 644 thousandths. They are followed by the Japanese Takaaki Nakagami (4th +0.793), Swiss Thomas Luthi (5th +0.798) and Moto2 World Championship leader Franco Morbidelli (6th +0.863), who has not found himself anything comfortable with his Kalex in this qualifying . The Spanish Jorge Navarro is classified eighth (+0.938), preceding Axel Pons (9th +1.007), Isaac Viñales (10th +1.061) and Xavi Vierge (11th +1.146), who suffered a crash in the final part of the session of which he left unharmed. Iker Lecuona will start tomorrow (27th +1.951), Augusto Fernández (28th + 2,449) and Edgar Pons (29th +2,775). With Alex Márquez completes a triplet of 100% Spanish poles in this Grand Prix de Catalunya, with Jorge Martín in Moto3 and Dani Pedrosa in MotoGP. Dani Pedrosa Takes the Pole in Montmeló, Two Crashes for Marquez in Q2!